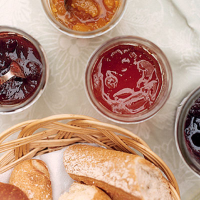 This is the easiest jam to make. Apricots have a medium amount of pectin, so they don’t tend to underset or overset. Adding a teaspoonful of dried, lemon-scented pelargonium leaves at the end of cooking gives it a twist. Cut small apricots in half and large apricots into quarters and discard the stones. Mix the fruit and sugar together in a large container, cover with a clean tea towel and leave in a cool, dry place for 18 hours. Place a few saucers in the freezer so that they're cold enough for testing later. Preheat the oven to 140°C/gas 1, then sterilise and warm 2 jam jars in the oven. Put the mixture in a pan and bring to the boil on a high heat. Reduce to a medium heat and cook for about 15 minutes, stirring occasionally. Test the jam when the juice has thickened and the bubbles are large – the setting point has been reached when a drop placed on a chilled saucer forms a skin that’s visible when lightly pushed. Remove from the heat and ladle into dry, warm jars. Tighten the lids and turn each pot upside down until cool. Store in a cool place for up to 6 months. This recipe was first published in Tue Jul 01 01:00:00 BST 2008.